Though met with mixed reactions and mediocre box office takings upon release, 1982's Blade Runner now remains an iconic cult hit and arguably one of Ridley Scott's finest directorial efforts. Now, over thirty years later, an unexpected sequel has arisen - whilst the acclaim is on par with it's beloved predecessor, as our it's lacklustre box office takings. In spite of such disappointment, Blade Runner 2049 undeniably ends up being one of 2017's very best films, and the sequel that the original certainly deserves. In 2049, biorobotic humans dubbed replicants are engineered for a variety of tasks; one such model, K (Ryan Gosling), works within the LAPD to hunt down and retire older replicant models hidden deep in society. His work eventually begins to unveil more and more mysteries about the replicants' history and potential, which in turn triggers questions over his own origins and purpose. 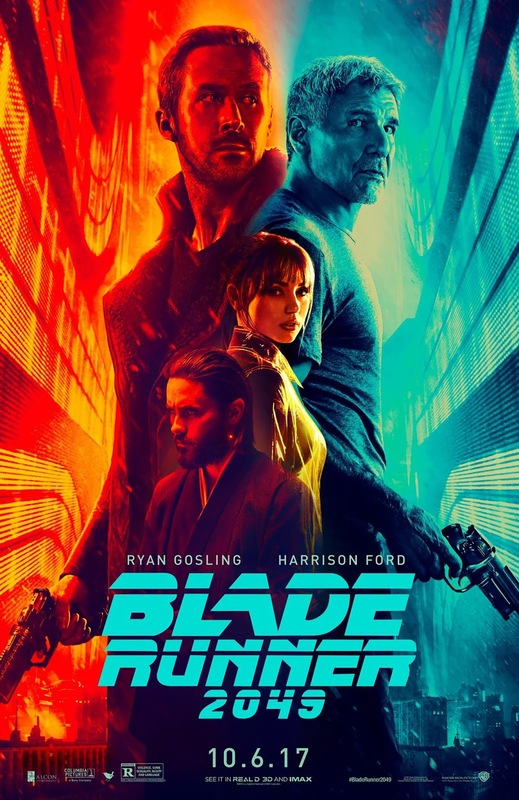 Blade Runner 2049 thankfully creates a story respectful towards the original, not something to milk it's fame - it intertwines a number of new ideas with it's already engrossing premise to further develop this rich fictional world. Everything is brought to life superbly in every category; superb art direction creates engrossing and equally unique dystopian future, depicted with some stunning CGI visuals and set design. Such aesthetics are further supported by a superb soundtrack by iconic composer Hans Zimmer alongside Benjamin Wallfisch - it pays homage to the original with similarly iconic themes whilst also offering up some lovely original music. Audiences will journey through all manner of twists and turns as the plot moves forward; while not without occasional sluggish moments (leading to a huge run time), the complex narrative is still handled with care and attention to detail. It challenges viewers with a number of intriguing questions about what is human and what isn't, and of course leaves it to the audience to deduce a number of interesting twists themselves - certain plot threads seem to intentionally lack a degree of finality, allowing for more subjective outcomes and inviting debate amongst audiences over what various scenes mean and how they fit in with the original film. This story prospers even further thanks to a superb cast lead by Gosling, also featuring talents such Jared Leto and Sylvia Hoeks in threatening if slightly forgettable villainous roles. Gosling's deadpan protagonist wins merit for an intimidating presence during various set pieces as well the genuine heartfelt persona that comes to fruition as more tender moments unravel; it certainly leads to what is arguably one of Gosling's best roles to date. Harrison Ford also makes a welcome return in the role of Deckett - going into his purpose within the narrative will lead to a wave of spoilers, but it's fair to say Ford's performance is just as spot on as it was in the original; the character blends seamlessly into the latter portions of the story and is developed even further with superb results, making his role far from a lazy cameo. Blade Runner 2049 didn't need to be nearly three hours long, some of it's set pieces are a little excessive, and the plot undeniably gets a little too confusing during it's deepest moments - but what you watch is still an enthralling piece of science fiction and a worthy successor to a beloved cult classic. Fans of the original will be just as impressed as those fairly new to the story; it's a shame to see it fail to attract the majority of the general public, but if it's still playing at your local cinema and you've yet to give it a chance, that's something you should quickly rectify for sure.